Would kids enjoy Savannah? You know…. lots of look but don’t touch. How much fun can that be? Not only that, but would it be affordable? 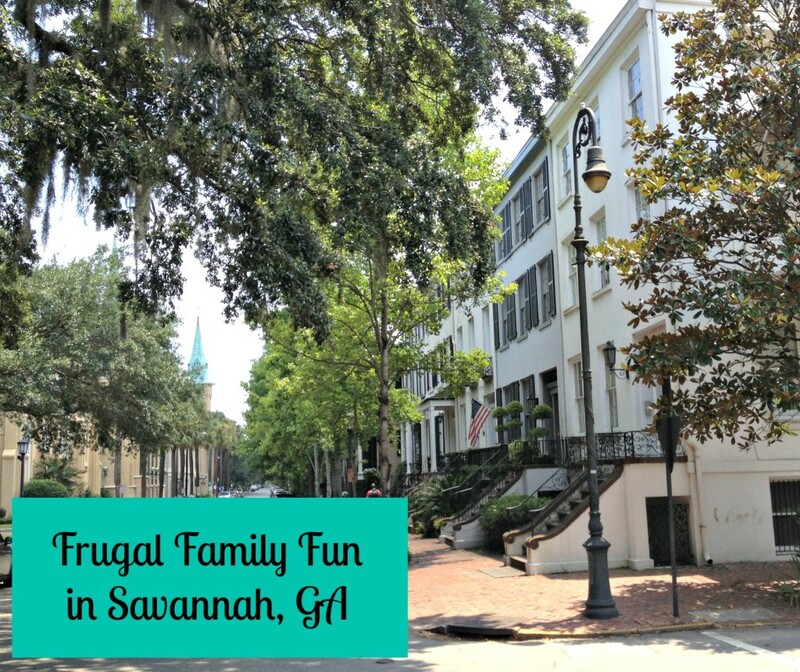 I am all about frugal family fun after all! We set off one afternoon to answer those very questions. But is it frugal family fun? Our first stop was the Savannah History Museum. Located in the old train station, the museum is cavernous. Displays highlight local historical interests: early agriculture in the area, railroad and transportation, historical pieces from the early days of the Girl Scouts and colonial American arts like quilting. Perhaps the most famous piece in the museum is the bench made famous in the movie Forrest Gump. The museum offers a few hands-on exhibits for kids, but mostly, this is a look and see but don’t touch museum. Top Left: quilt patterns on display. Bottom Left: The Forrest Gump bench. Center: Part of the interactive children’s area — a study of hats. Right: Me, pretending to “chat” with the hatted silhouettes! While the history museum lacked pizazz (though it was informative), the Georgia State Railroad Museum located behind it is spectacular! The museum is home to many railroad cars, cabooses, engines and other railroad related artifacts from the heyday of railroad transportation and travel. If two adult women have fun climbing around in cabooses and exploring train engines, imagine how much more fun it would be for kids! Every day, the museum offers train rides to guests — included in the price of admission (sadly, we missed it). The Railroad Museum offers other tours as well. We took the train engine tour and learned some interesting facts about train engines through the years. AND, we got to climb on the engines too! Left: climbing the caboose. Center: that engine is enormous. Right: close up of a wheel. Admission: $7.50 for everyone age 12 months plus. Families can enjoy the Savannah Children’s Museum which is located by the Train Museum. Hours change seasonally, so plan your day around Children’s Museum hours. A museum staffer told me the Children’s Museum offers more hands-on activities than the history museum and is geared toward younger kids (elementary and below). Old Fort Jackson, including a small history museum and cannon firings. When taking kids to Savannah, I highly recommend a three-attraction ticket which is available at any of these five attractions. Allow an hour or two for each attraction, maybe a bit more for the railroad museum, and enjoy a day immersed in Savannah’s history. To make a historical visit to Savannah (or anywhere) as fun as possible, focus on the exhibits that most interest the kids. Allow them to explore hands-on activities when available. 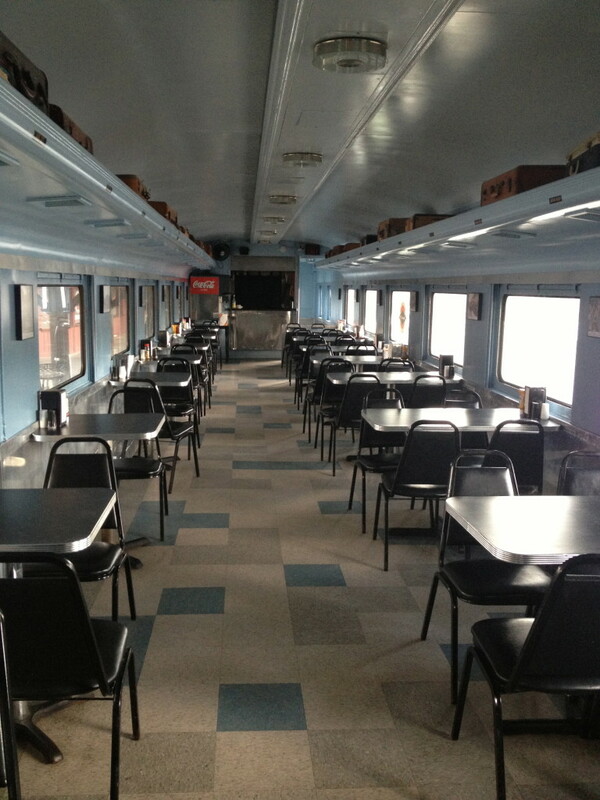 Enjoy the wide open spaces in and around the museum complex… And make time for a snack at the train dining car! Old fashioned dining car, complete with overhead luggage compartment! While I received complimentary admission to attractions courtesy of VisitSavannah, this does not affect my review of the places visited. All opinions are my own. Join us on Facebook to join the discussion and get updates when new articles are posted. You can also sign up for our email newsletter to get updates that way! Coming soon, a post on the Savannah Fire Department and a two or three day Savannah customizable family itinerary with treasure hunt! Hi Karen, I always want to go Savannah. Thanks for the tips. I certainly keep them in mind when I get to go. Marisol, When do you think you’ll make it to Savannah? I was in Savannah last year and it strikes me as a city that would be family friendly. A ghost tour if the kids were old enough would be fun too. It is definitely family friendly. My daughter would be spooked by the ghost tours though… she’s quite dramatic. This was a great post about Savannah. I just took my daughter there in July. Wish I had a few of these tips before we left. It was just a day trip for us since we live in Charleston, SC. Have you ever been there. Great place for a family trip. We loved it so much we moved down here permanently from CT.
You have such a great family travel blog. I really enjoy reading your posts! I haven’t been to Savannah, would love to visit. You made it sound like such a nice place to spend a few days. Thank you for that sweet comment. I hope this site is valuable to families who want to travel on their budget. Look for some great posts on Illinois soon.